A person whose name is synonymous with the Wayne County sports scene is Wilbur Berkey, who spent 39 ½ years at Smithville High School. He earned that distinction, not as a player, but as a topflight coach who made a favorable and lasting impression on the hundreds of young people who were fortunate enough to serve under his tutelage. He was an athlete, however, playing for the Smithville High School basketball team which won the Wayne County League crown in 1927. He was also the starting Smithie second baseman for three years. Moving on to Bluffton College, he won three letters in baseball, captaining the team during his senior year. He was elected to the Bluffton College Athletic Hall of Fame in 1972. 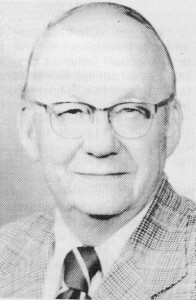 Wilbur coached baseball from 1937 to 1952, and basketball from 1937 to 1961. His 1939 baseball squad won the first tournament championship in the school’s history. In all, his teams won five Wayne County baseball titles, a basketball league crown, a sectional championship, sent six teams to Ashland sectional play and three to the Kent district level. Berkey was always a man-in-motion. During one five-year period he coached baseball, basketball and track, in addition to serving as principal. –Calling the initial meeting to organize the Wayne County Coaches Association and serving as secretary for the first 10 years of existence. –Founding the Northern Ohio Basketball Coaching School in 1945 and conducting it for 20 years. The school was regarded as the equal of any coaching clinic in the nation. –Promoting the Wayne County All-Star Basketball game which created much local interest and was held for 10 years. In addition, he has always been in the forefront of professional activities and an active participant in community and church affairs. His influence on the entire Wayne County sports front has been one of continued dedicated service.